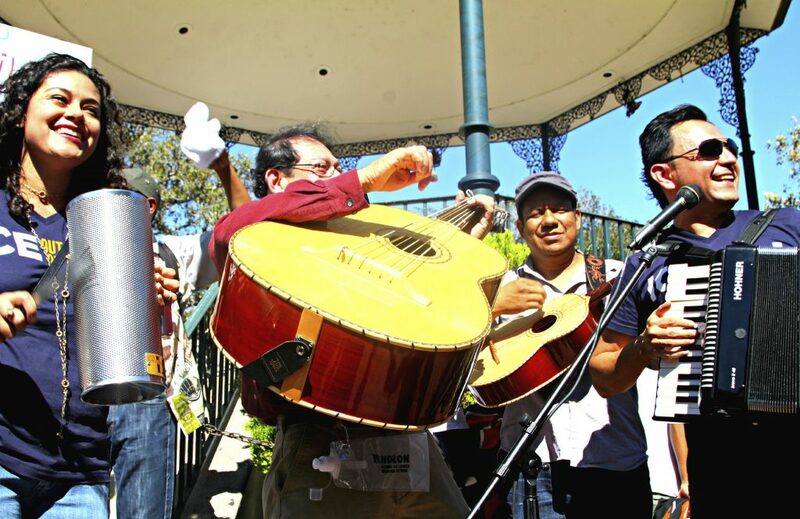 The day laborer band was created after an ICE (Immigration and Customs Enforcement) raid that took place in City of Industry in 1995 while a mobile health clinic of the Los Angeles County Health Department was providing HIV and other STD testing. Omar Sierra, one of the main vocalists of the band was present during the raid and decided to write a Corrido (ballad) about the incident. As time went on, the Day Laborer Band expanded and became a fundamental tool in the organizing effort. The band’s purpose is to inform, educate, organize, and mobilize day workers, sensitize the general community about day labor related issues, and denounce the abuses committed against them. The band has performed for day laborers at corners and centers, for local unions, for students, for activists, for teachers, etc. People see us struggle for a living on the street corners of big cities, in front of construction stores, on the sidewalks, in parks and parking lots. Some of us are tall, short, skinny, fat, young, and old. We are the workers who are commonly called esquineros (corner keepers), day laborers, day workers, or street workers. We do not come from the same country and we do not have the same customs, or manners of speech. Some of us had the opportunity of getting a certain level of formal education and others of us cannot even read or write in our own language. We day laborers are all different, but alike at the same time. Pedro, Juan, and Miguel all want the same thing: an employer that arrives at the corner or at the formal hiring sites to give us work. What do we day laborers do while we wait for a job at the corner or at the job centers? We have no choice but to interact and learn to co-exist with each other; even though many times we are forced to compete for work. Up to now, we day laborers have co-existed among jokes, stories, legends, words, expressions, heckling, nicknames, fights, work, music, and soccer games. But we have to understand that it is not only about co-existence; it’s also about sharing and organizing ourselves in synch with our happiness, struggles, and sorrows created and recreated by popular culture. The goal of the Jornaleros del Norte is to promote this celebration and struggle in order to strengthen the base for an organized, harmonious, peaceful, and intentional co-existence. 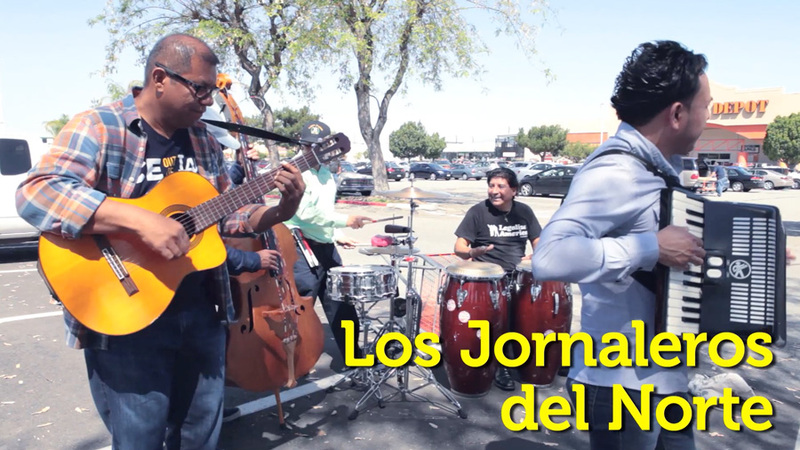 Los Jornaleros del Norte want to recover the cultural elements that emerge from the social interaction of people. The second step is to return those elements in a more ordered and critical form to the same people so that they can digest it and consciously begin to create a culture of liberation, a truly popular culture that addresses their daily needs and problems. It is under these theoretical and methodological principles that the Day Laborer Band was created. Just because of the Damn English that I couldn’t speak. Three days later, with his own initiative, Omar brought his own guitar to the corner and played and sang for his fellow day laborers. The corrido narrates in detail the INS episode and at the same time denounces the abuses that were committed during the raid. For the day laborers of City of Industry and for others, it is easy to identify with the song’s lyrics and melody. By the time new members joined the group, a second song was composed, “La Frasesita” (The Little Phrase). Later “La Paliza” (The Beating), Aguilares, “Sí se puede” (Yes We Can), Las Redadas (The Raids), and other songs were written. Without ever having to stop being from the south. The original members of the group are: Omar Sierra (Honduras), Jesús Rivas (El Salvador), Julio César Bautista (Guatemala), Paula de la Cruz (Mexico), John García (Honduras), Omar García (El Salvador), and Pablo Alvarado (El Salvador). We all share similar histories. We have humble upbringings as peasants and today most of us continue to work as day laborers. It has not been easy to maintain and consolidate the musical group. Being day laborers, what comes first is finding work every day. But with a lot of sacrifice we continue to succeed, even when we have to postpone rehearsals when we have to work. Not withstanding, just like any other human being, Los Jornaleros del Norte have dreams and aspirations. We want to record a CD, we want to have our own sound equipment, good instruments, and a good income that would allow us to improve our lives and to dedicate more time to music and to our educational/organizing work. Besides the musical group, the day laborers have also organized a soccer league, a theater group, a union training school, and an editorial collective. Los Jornaleros del Norte are not organizing in a vacuum, they are part of larger effort to organize a Day Laborers Union which would fight for our own human and civil rights. The Union is an emerging reality that responds to the needs and problems that arise with the daily search for work at street corners and day laborer centers, as well as to influence public policy affecting us as workers and immigrants. Los Jornaleros del Norte feel honored to be part of this effort. The music of Los Jornaleros del Norte makes workers feel proud of being workers, and restores our humanity lost through so much suffering. The artistic spirit of Los Jornaleros del Norte accompanies the leadership and members of the Day Laborers Union wherever they may go, especially when they have to negotiate with the police, businesses, bosses, or neighbors. It also accompanies them in organizing at street corners and day laborer centers. The Day Laborer Band has become a symbol for one of the most rejected sectors of society by reflecting the festive spirit and struggle of our Latin American people. We hope that when you see those men of all colors and sizes, in their work clothes, with hardened looks, beaten down by the sun, with their faces that project distrust because of the life of poverty and struggle, don’t think only of the worker. Also think of the artist, the musician, the poet, the soccer player, the actor, the journalist, the comrade, the friend, the father, the grandson, the husband, the grandfather, the brother, the human being.